It's rare that pottery can give you a good scare, but Axel Salto's does. You think twice about touching it. It gives you goose bumps; it looks like goose bumps. Mr. Salto, a Danish ceramist and painter born in 1889, maintained a studio and also worked for Royal Copenhagen from 1934 until his death in 1961. He produced a body of work that didn't take those words lightly. 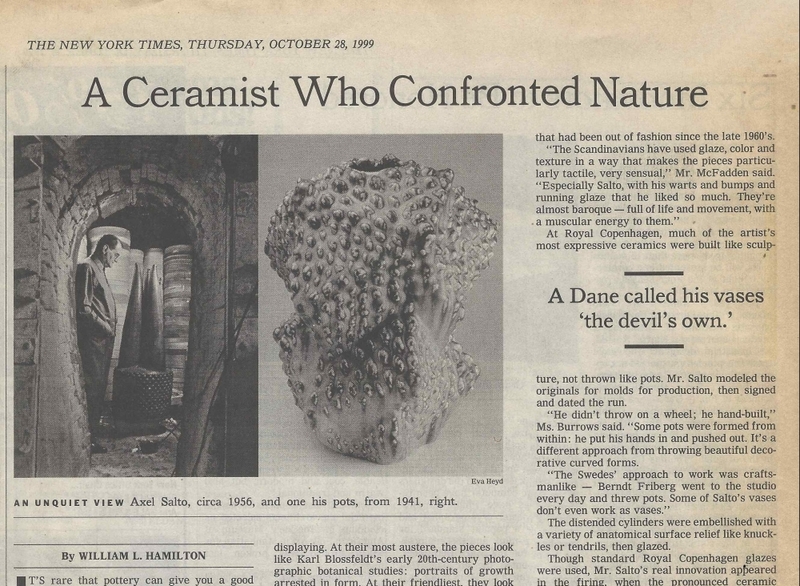 The ceramics and the drawings from which they were manufactured are the focus of a small show, ''Forces of Nature,'' opening today at Antik, a modern design gallery in TriBeCa, organized with Mr. Salto's youngest daughter, Naja, and Jorgen Dalgaard, a Danish dealer. At their most nightmarish, the ceramics look like those science fiction spaceship interiors that turn out to be the stomach of the thing chasing you. Pictured in the book is a vase that could be a toad swallowing the flowers it is meant to be displaying. At their most austere, the pieces look like Karl Blossfeldt's early 20th-century photographic botanical studies: portraits of growth arrested in form. At their friendliest, they look like Maurice Sendak characters: the horned gremlins and thorned fears that dance while you sleep, protected by childhood. Mr. Salto was also an author of children's books. Antik's owners, Juliet Burrows and Kim Hostler, have been assembling the group of 40 vases and 20 drawings for two years. ''We started thinking more about Salto as an artist,'' Ms. Burrows said. ''He was a tortured soul. You can see it in the work, in its progression -- from fluting which is decorative to budding to spikes and viscera.'' Mr. Salto lost both his sons; his first, Adam, died a prisoner in World War II; his second, Axel, was institutionalized as a schizophrenic for most of his life. Interest in Mr. Salto comes at a time when interest in modern Scandinavian art ceramics, exceptionally strong of late, may be turning a corner, from the pure Asiatic shapes and glazes -- of Swedish ceramists like Berndt Friberg and the companies like Gustavsberg that produced him -- to more idiosyncratic, sculptural work. ''In general, I think there is a slow, building momentum for a return to complexity and richness and detail,'' said David McFadden, senior curator of the American Craft Museum. As curator of decorative arts at the Cooper-Hewitt National Design Museum, Mr. McFadden organized ''Scandinavian Modern Design: 1880 to 1980,'' a 1982 exhibition that restored interest to a subject that had been out of fashion since the late 1960's. At Royal Copenhagen, much of the artist's most expressive ceramics were built like sculpture, not thrown like pots. Mr. Salto modeled the originals for molds for production, then signed and dated the run. ''He didn't throw on a wheel; he hand-built,'' Ms. Burrows said. ''Some pots were formed from within: he put his hands in and pushed out. It's a different approach from throwing beautiful decorative curved forms. The distended cylinders were embellished with a variety of anatomical surface relief like knuckles or tendrils, then glazed. Though standard Royal Copenhagen glazes were used, Mr. Salto's real innovation appeared in the firing, when the pronounced ceramic shapes forced glazes into irregular rivulets and pools. Protrusions left parts of the pot raw; as the glaze ran thick or thin, it changed color. Mr. Salto spoke of the ''boniness'' of the form and the ''fattiness'' of the glaze. The finished, fired pieces look as if they were pushing at their own skin. Mr. Salto's ambitions have produced prices that can be scary, too. The Antik show's pieces range from $600 to $26,000. They represent a hard push on the modernism market's part to turn the higher end of the decorative arts into a fine art commodity. Ms. Hostler said that Mr. Salto's most serious collectors have tended to be established ceramics collectors interested in potters like George Ohr and now pursuing newer names. Antik is at 104 Franklin Street (Church Street). ''Forces of Nature'' is open through Nov. 18; open Monday through Saturday, 11 A.M. to 6 P.M.; catalogue, $15; (212) 343-0471.